The Leviton 4108W1SP is from the line of wallplates and housings. This model comes in stainless steel color. The decora inserts have the feature to accept all QuickPort snapin modules. You can find them in flush or recessed versions, which allows the QuickPort Connector to rest flush with the wallplate. The stainless steel wallphone wallplate has to meet all applicable standards: cULus listed and meet FCC part 68. 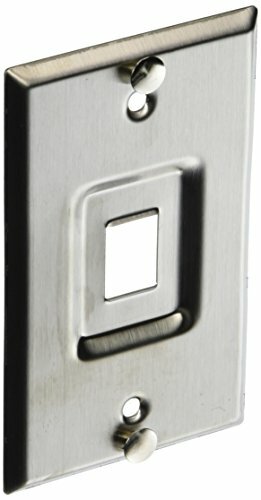 This stainless steel QuickPort telephone wall jack is available in recessed and flush designs.